In a few weeks it's happening again. On Monday April 8th 2019, the inner city of Zurich will be closed off for any traffic for the annual Sechseläuten. What annoys car drivers is the joy of anyone working or going to school in Zurich or a neighboring town since an additional free day is always well received. But what is Sechseläuten and how do the people of Zurich celebrate it? Sechseläuten is a spring holiday unique to the city of Zurich. The rest of Switzerland including most towns and places in the canton of Zurich do not celebrate this holiday and students and workers don't get a day off. 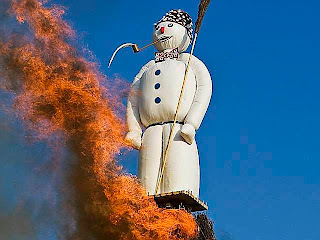 Sechseläuten takes place in the middle of April and centers around an artificial snowman called the "Böögg" that symbolizes winter. After a procession of all guilds of Zurich (usually in traditional costumes) the parade reaches the Sechseläuten-Platz, located right at the shore of Lake Zurich. This is where the Böögg is burnt on a stake. While the horse riders of the different guilds ride around in turns, everyone pays attention to the head of the Böögg which is filled with firecrackers. Time until the head explodes is measured. Popular belief has it, that the faster the Böögg looses its head (e.g. the head explodes with loud boom) the warmer and nicer the following summer shall be. If you'd like to have your own miniature Sechseläuten, you can buy a Pocket Böögg and time your own summer! The name Sechseläuten (lit. six o'clock bells) comes from a decision of Zurich's city council in 1925. The bells of Zurich's second largest church the Grossmünster were used to call in quitting time for Zurich's working population for generations. On March 11th 1925 the city council decided to set quitting time for summer at 6 pm and winter quitting time at 5 pm. So the Sechseläuten basically refers to the switch of winter quitting time to summer quitting time. This years Sechseläuten procession will start at 15.00 on Bahnhofstrasse and work its way through most of downtown Zurich. If you consider going to watch it, you can find more information about the procession and Sechseläuten 2019 on the Sechseläuten website. If you plan on going, I recommend you watch the procession in the beginning on Bahnhofstrasse and then head over to the burning of the Böögg after you've seen all the different guilds. Be ready for big crowds though!